1,8-Cineole (cineole) is a Eucalyptus leaf toxin that defends against predation by herbivores such as the brushtail possum (Trichosurus vulpecula). The aim of the current study was to characterize the pharmacokinetics of cineole in the possum to improve understanding about how possums can avoid cineole toxicity when eating a Eucalyptus diet. Nine male possums were trapped in the wild and acclimated to captivity; a subcutaneous port was then implanted for venous blood sampling. Cineole was administered intravenously (10 and 15 mg kg�/sup>) via a lateral tail vein and orally (30, 100 and 300 mg kg�/sup>) by gavage, and blood concentrations of cineole and its metabolites were determined by gas chromatography. Cineole had a large terminal volume of distribution (Vz = 27 l kg�/sup>) and a high clearance (43 ml min�/sup> kg�/sup>), equal to hepatic blood flow. The terminal half-life was approximately 7 h. Oral bioavailability was low (F = 0.05) after low doses, but increased tenfold with dose, probably due to saturable first-pass metabolism. 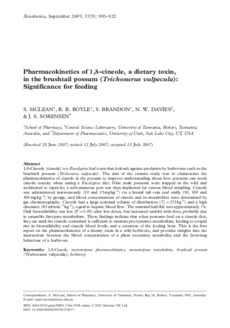 These findings indicate that when possums feed on a cineole diet, they eat until the cineole consumed is sufficient to saturate pre-systemic metabolism, leading to a rapid rise in bioavailability and cineole blood levels, and a cessation of the feeding bout. This is the first report on the pharmacokinetics of a dietary toxin in a wild herbivore, and provides insights into the interactions between the blood concentration of a plant secondary metabolite and the browsing behaviour of a herbivore.